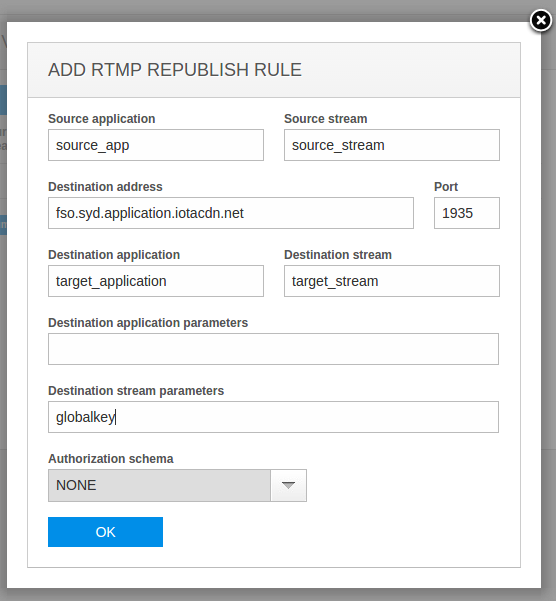 RTMP republishing is a popular feature within Nimble Streamer RTMP capabilities. It's used for delivery of live streams from origins to other Nimble Streamer edges or even publish to YouTube. Some CDNs use authentication tokens that are specified in streams, unlike those which require tokens in application names. One of examples of such CDNs is EdgeCast. To set up re-publishing to EdgeCast, you should follow this article describing basic scenario. 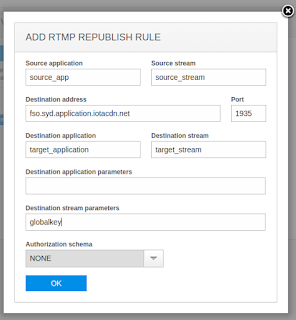 When you come to a point when you open RTMP re-publish dialog, you need to do the right matching of your publishing URL and re-publishing dialog. And here is an example of the dialog. Add republishing to EdgeCast with stream parameter. Here, a source_app and source_stream are the names of app and stream which you already have as a result of your incoming stream processing, see the mentioned article for details. So you can now publish your RTMP streams not only within your streaming network, but also use other CDNs as a backup. Re-publishing to Wowza with proper authentication and ModuleSecureURLParams module. You may also consider re-publishing incoming RTMP streams with inserted ads. Nimble Advertizer provides a framework for inserting pre-roll and mid-roll ads into live streams for further output via RTMP, SLDP and Icecast with custom business logic and per-user ads. So if you create RTMP stream with ads insertion and pull it for further re-publishing, you can provide your target CDN with properly sponsored content. Visit Advertizer web page to find out more about server-side ads insertion functionality. If you need to change the outgoing content in any way, like change the bitrate, use our Live Transcoder for Nimble Streamer to transform. It has high performance and low resource usage. Let us know if you face any issues during the setup.